Anyone who visits the site can see the online BARS manuals. However, you can only use the MyBARS service if you are logged in. At the SAW login page, enter your SAW username and password to login. If you need to create a SAW account, click the “Sign up!” button and follow the prompts. For detailed instructions on how to create a SAW account or login using SAW, see our SAW user guide. 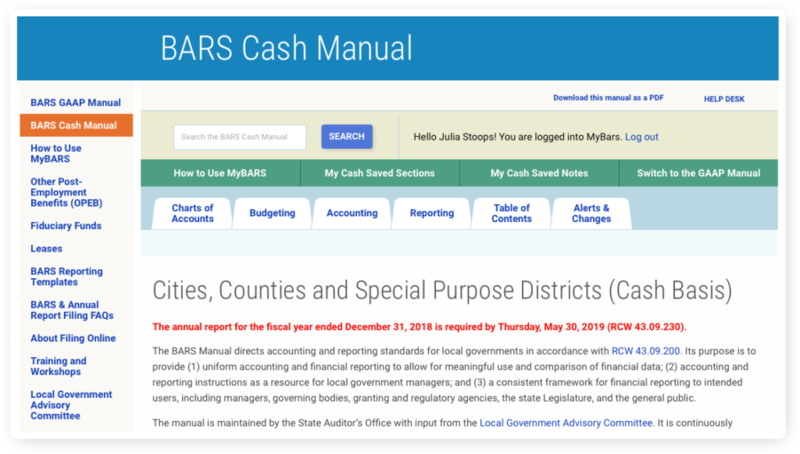 On the SAO site, in the main menu, find the “BARS & Annual Filing” tab. 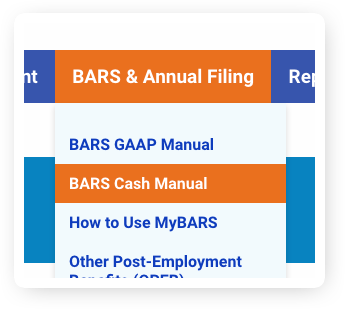 The BARS tabs are structured like the manual itself: Charts of Accounts, Budgeting, Accounting and Reporting. You can get to any BARS manual section by going inside one of the first four tabs. You can also access all sections via the Table of Contents (5th tab.) BARS Alerts and Significant Changes are in the 6thtab. 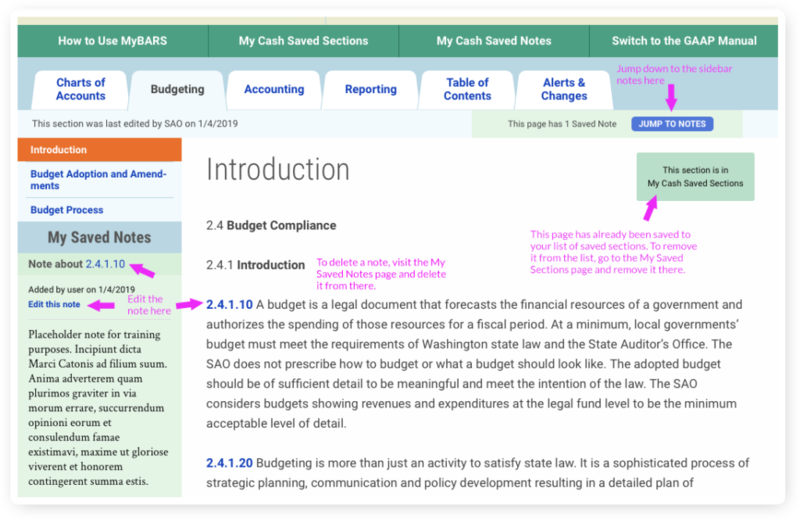 Cash and GAAP each have their own Saved Sections and Saved Notes pages. You can also print out your accumulated saved Sections and saved Notes. Find a section of the manual you wish to work on. 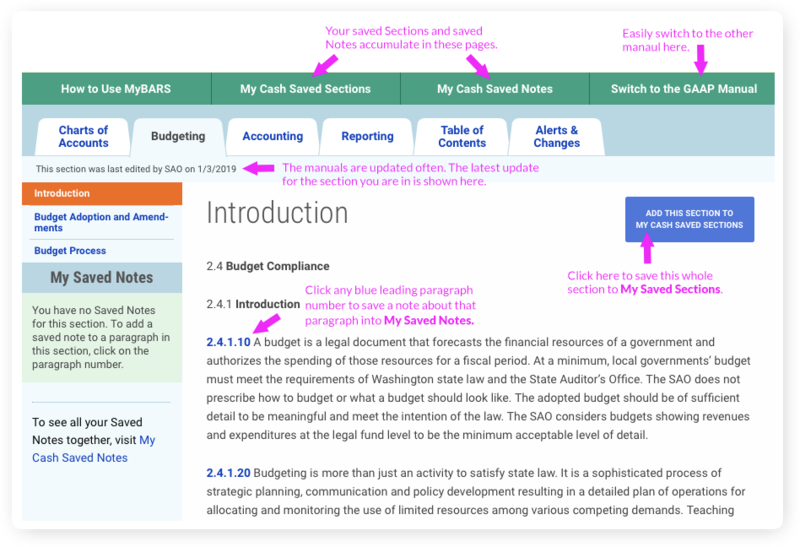 For this document, we’ll use the Introduction section under Cash manual’s Budgeting tab. To save the section to My Cash Saved Sections, click the big blue button near the top right of the page. The page automatically gets saved to My Cash Saved Sections. To save a note about a paragraph, click on the blue number leading that paragraph, and a window will pop up into which you can type your note, then submit it. Throughout the manual you will see other blue numbers that are links to other information. These are not the sorts of numbers you can add notes to. You can only add notes to the blue numbers that begin new paragraphs. 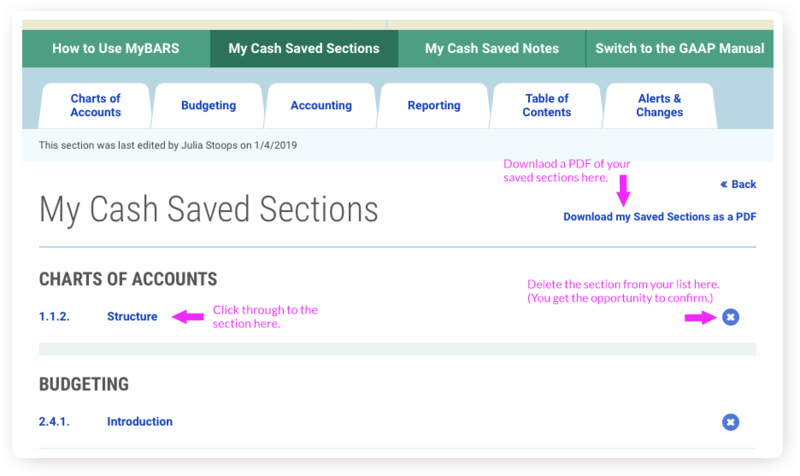 To access this page, click on “My [Cash or GAAP] Saved Sections” in the green bar above the tabs. In this page you will see a list of all the sections you have saved. click through to the content of each section you have saved. 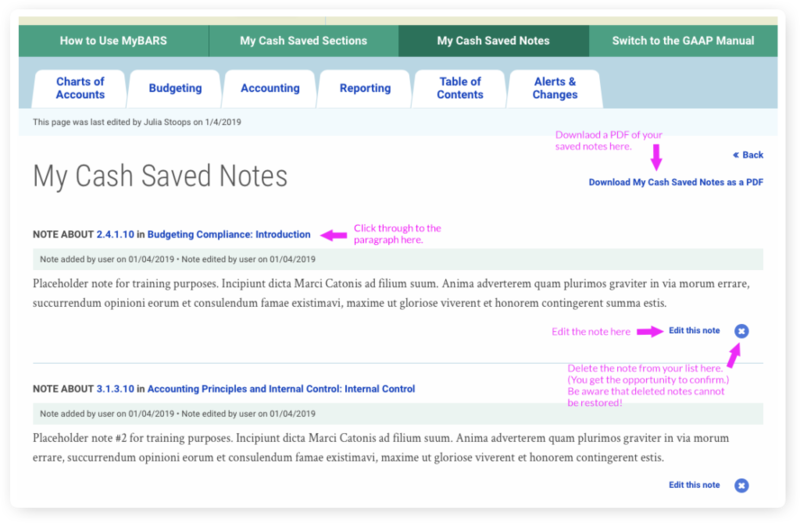 To access this page, click on “My [Cash or GAAP] Saved Notes” in the green bar above the tabs. In this page you will see a list of all the notes you have saved. click through to the paragraphs that notes refer to. download a PDF of just your saved notes. The big blue button is now a green notice that the section is saved to your list. The note you wrote is now visible in the sidebar. The sidebar displays all notes you made for any paragraphs within this section. If the sidebar menu is long, you may have to scroll to see notes that apply to paragraphs in this section. Use the “Jump to Note” button under the tabs to conveniently jump down there. You can edit a note by clicking on its paragraph number in the main content or in the sidebar. Note that you can remove saved sections and delete saved notes only from within the My Saved Sections and My Saved Notes pages. You cannot remove/delete them from here. To repeat: removed saved sections are easy to restore to your list, because the sections remain in the overall manual. On the other hand, deleting saved notes is permanent, because the system does not store them anywhere other than within your own account. Need more help? Please contact our Help Desk.